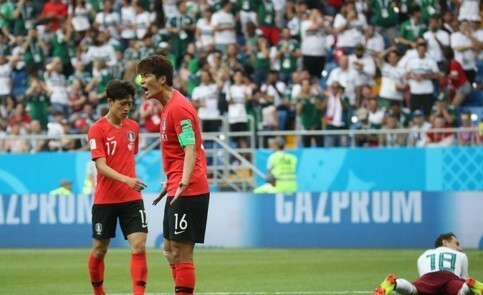 The Korea Football Association said Sunday it will soon send a letter to FIFA to express its regret over a referee's decisions in South Korea's 2-1 loss to Mexico at the 2018 FIFA World Cup. A KFA official claimed that referee Milorad Mazic missed a call before Mexico scored their second goal in their Group F match at Rostov Arena in Rostov-on-Don, Russia, on Saturday. "Regarding plays related with Mexico's second goal, we watched the video this morning and concluded that there was a foul on Ki Sung-yueng before Mexico won the ball," the official said ahead of national team training in Saint Petersburg. "We want to express our regrets over this decision." Before Javier Hernandez made it 2-0 for Mexico in the 66th minute, South Korean captain Ki Sung-yueng was dribbling the ball in the midfield, but he was brought down by Hector Herrera. The referee, however, didn't blow the whistle, and while South Koreans players paused, Mexico quickly transitioned for a counterattack that led to Hernandez doubling the lead with his right foot. "Even though the referee may have not seen the situation, we believe an assistant referee must have watched the foul," the official said. "Regarding this matter, we will file a complaint letter by today." The official said South Korea will also raise the question of why the referee didn't use the VAR (Video Assistant Referee) system, since they believe Herrera's foul was directly linked with Mexico's second goal. The KFA official, however, said their complaint isn't an official appeal for the missed call as they are not asking FIFA to reverse it. "There's zero percent of chance that the call will be reversed," the official said. "We just want to express our regrets and make sure that this kind of incident never happens again in our next match."